Diabetes Care, the journal of the American Diabetes Association, published a statement after the 2nd Diabetes Surgery Summit (DSS-II) recognizing metabolic (bariatric) surgery as a standard and safe treatment option for some people with type 2 diabetes. Notably, only 25% of signees were surgeons, with researchers and clinicians making up the rest of the statement’s signees. So far, 45 international organizations and their clinicians and researchers have endorsed the guidelines. According to the American Society for Metabolic and Bariatric Surgery, 78% of people who undergo metabolic surgery experience a reversal of type 2 diabetes symptoms – sometimes termed remission – characterized by a return of blood glucose to lower levels common for people without diabetes. In such cases, where blood sugar levels drop post-surgery, type 2 diabetes progression may be slowed, stopped, or reversed altogether, in turn reducing risks of long-term diabetes-related complications. When is metabolic surgery the best option? For people with BMI over 40, metabolic surgery is recommended. Calculate your BMI here. For people with BMI between 35 and 39.9 and high blood sugar (hyperglycemia) that is not well managed with current medication, diet, and exercise level, metabolic surgery is also recommended. For people with BMI between 30 and 34.9, metabolic surgery could be considered as a treatment option. Note: For people of Asian descent, adjust the BMI guidelines for metabolic surgery by subtracting 2.5 from the BMI threshold for each treatment recommendation. For example, a BMI over 37.5 (not 40), would carry a recommendation for metabolic surgery. What are disadvantages of metabolic surgery? Invasive medical procedures, such as metabolic surgery, have a number of risks associated with the performance of the procedure itself, as well as complications that may arise during or after. Surgery often requires recovery time away from work. Surgical procedures are often expensive, and costs may not be covered – in full or in part – by health insurers, Medicare, Medicaid, etc. Efficacy is not guaranteed; success of the procedure may differ person to person. Surgical procedures are rarely reversible. Metabolic surgery may have long-term adverse effects resulting from changes to the stomach and digestive system including, but not limited to, malnutrition, leaks in the gastrointestinal system, bowel obstruction, dumping syndrome, or ulcers. For example, a 2016 study found that up to 90 percent of people who undergo gastric bypass will self-report at least one side effect despite a general improvement in wellbeing for most patients post-surgery. In a small number of cases – less than 1%, from a Swedish study – severe hypoglycemia may result after metabolic surgery, as late as months or years later. What are the options for metabolic surgery? Roux-En-Y Gastric Bypass: This type of metabolic surgery (see image) alters the course of the GI track so it bypasses most of the stomach and the upper part of the small intestine. This type of metabolic surgery usually results in significant weight loss and remission of type 2 diabetes in 80% of people. 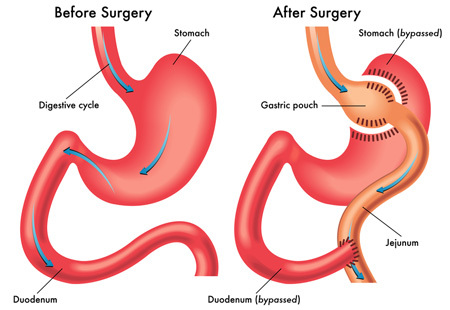 Adjustable Gastric Band: This type of metabolic surgery involves placing a band around the upper part of the stomach. The surgery results in significant weight loss and type 2 diabetes remission in 45-60% of people. Additional, albeit less common, metabolic surgery options include sleeve gastrectomy and duodenal switch. Read here for more on metabolic surgery.